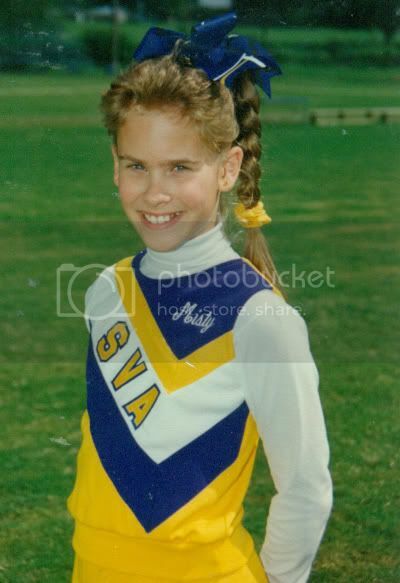 I started cheering competitively in the 4th grade. I loved every minute of it. I can remember doing dance routines to this song and this song. I won the school spelling bee while wearing my cheerleading uniform. (It was game day!) I was often on top of pyramids. I remember getting dropped. A lot. We would often practice on or near the football field. We'd get in trouble for ogling the high school boys. Every year, we'd get to cheer with the 'big' cheerleaders at one of the basketball games. I can't forget about cheerleading camp. Our school hosted a camp every year. Squads came from all around to learn from the best. You may think I'm exaggerating, but I'm not. We dominated for many years. 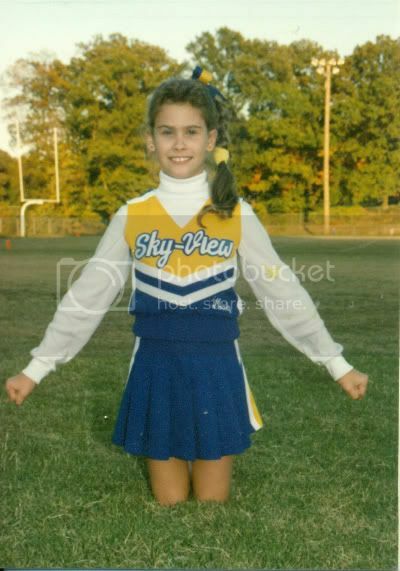 Anyway, cheerleading was a huge part of my youth. Let's take a look. I blame the hair on my mom. Why is my scrunchie yellow instead of gold? Why didn't someone fix the curl that was out of place? I don't have mustard on my turtleneck. There's something on the picture. Again, I blame the hair on my mom. Look, it's a gold not yellow scrunchie! Please ignore my buck teeth. They improve. See? I told you my teeth improved. Wait. What's that? A unibrow! A girl can't catch a break. So cute! My childhood best friend and I practiced and practiced and practiced to try out for cheerleader our sixth grade year. I had everything down pat and would've totally made the squad, but I got cold feet and never even tried out. Ugh! And PS - I had a unibrow too. Ick! Why didn't anyone TELL us these things?! I was on the drill team for a year. I sucked at it and was much better off sitting in the bleachers! Cuuuuute! I love looking back on old pics. I have vowed to never cut bangs on my 2-year old for fear of her looking back one day making fun of her big bangs and rolling her eyes at mom's decisions :) Fun, fun! Thanks for sharing! Oh my goodness, those are SOO CUTE! I was never a cheerleader. Too tall. They would have never been able to throw me in the air. I would have messed the whole balance of the pyramid too being as tall as I am. Sigh. One time before high school started I went to try to learn a cheerleading routine to do try outs later and it didn't take me long to realize I SUCKED at doing it!! I left and never went back! Hahaha love the uni! these are classic! I did a couple of elementary school cheers during basketball games with the "big girls". I remember being so proud of myself for getting to be a part of it. Did you cheer in high school? I cheered Freshman year-not nearly as much fun. Girls got a lot meaner! You are precious! 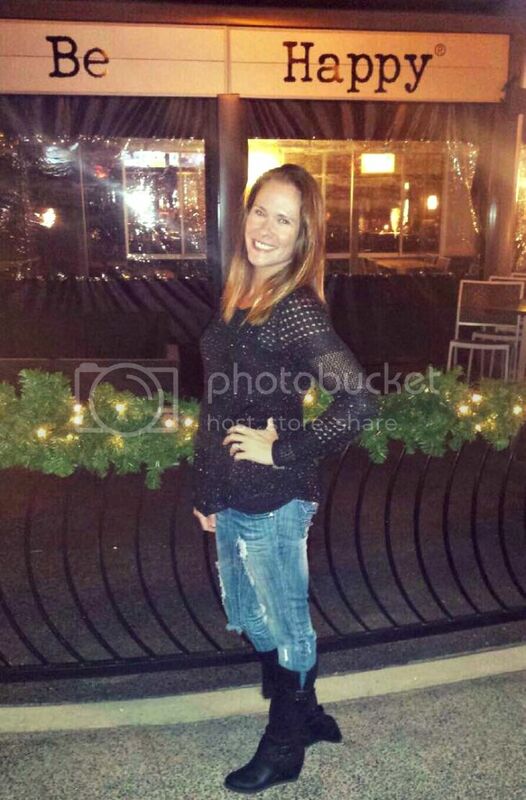 I was a cheerleader as well for many many years and I was dropped on my head in COLLEGE. Needless to say I quit after that. you were such a little hottie! Too cute! I love to look back at old pictures of my own (embarrassing and good, alike). My daughter has been cheerleading since 2nd grade (5th, now) and last year her team came THIS CLOSE to going to nationals. I was never a cheerleader so I was very overwhelmed when I went to my first competition - What A Spectacle! But I have to admit every time she competes I cry when she is done!!! Love these! 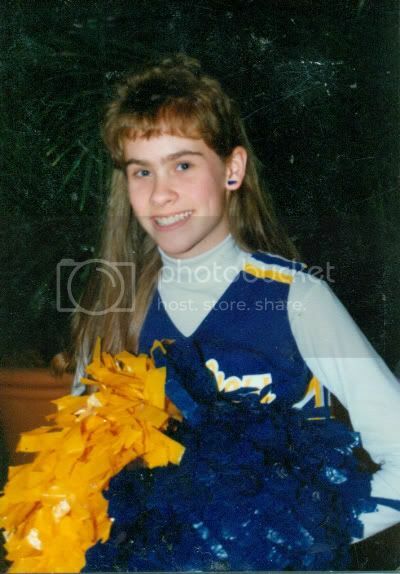 I'm glad I didn't do cheer as a kid I had horrible hair and even though my mom was a hair dresser, she never fixed mine. I did ballet and dance for years and when I made it to HS tried out and made the Dance Squad - let's just say I have lots of pictures of me in my uniform (like a cheer uniform) and I have HUGE eyebrows... still don't know why my mom didn't stop that shizz from happening!!! Great pix and memories... I wasn't a cheerleader but always admired those that could do it... my older sister was one and I lived through her..
LOL, I think I love you. My dad used to make fun of my "buck teeth" all the time. What a jerk!